The new pond at Whitmuir The Organic Place is beginning to look less like a reservoir on a construction site and more like a place to find wildlife. Today, in rare gaps between cloudbursts, we transplanted around seventy clumps of native Scottish wildflowers (Scotia Seeds Pond Edge Mixture, raised from seed). If the young plants manage to survive being planted into what looked to me rather like potters’ clay, they will eventually flower, self-seed and spread. Watch this space. Even better, if you are lucky enough to be anywhere near Edinburgh, Peebles, West Linton or Lamancha, go and see the new pond. I am a lucky man. Not only do I live in a beautiful part of Britain (right now I am looking at a stunning sunset), I am also only a couple of miles from an organic farm that has a shop, a restaurant, things to see and walks to go on. 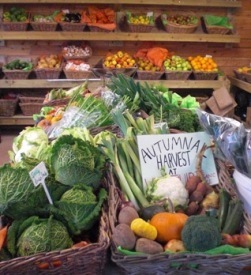 There is nothing pretentious about Whitmuir (for more, click on their link) and they are so good, and all work so hard, that they seem to be winning all kinds of awards for their produce, their food, and for the farm itself as a visitor attraction. There are signposted walks that I have yet to go on. They also run little events (see here). Tomorrow, being Halloween, there is something for children, including (amongst several other things) throwing apples to the pigs. When I first saw the list of events I misread it and thought it said ‘throwing apples at the pigs’. This, from my previous observations of these creatures, would not be a wise thing to do. This time, Greylag Geese. I thought they were Canada Geese, and when I got home I had to look them up. Apparently they migrate here in winter (why should anything want to migrate HERE?). I am definitely not a ‘twitcher’ or a ‘birdie’, but I do know the difference between a robin and blackbird – and swans and geese. This was a flock of geese only a few feet from me in a cornfield. They were camera shy, because most of them flew off (there were many more than this, about one hundred – Oh for a wide-angle lens!). Note the way they are all looking towards their less-brave mates, out of the shot, circling away toward the Pentland Hills. They all came back as I was driving away. Clearly they don’t like diesels. I have started taking a camera with me, a small one borrowed from my wife (taking it everywhere deals with that problem of having to say to myself ‘Wow! I wish I had a camera…’). I was on high ground between Penicuik and West Linton (if you don’t know where it is then Google it) in a spot where until recently there was the possibility of having a field of massive wind turbines. I see thousands of geese migrating through here every year, including the odd solo swan (where are they going, these sleek, long-necked guys, and where have they come from, they are so amazingly graceful!). A wind farm in the valley would have chopped them to pieces.